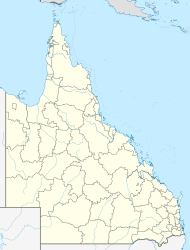 Bamaga (Kalaw Lagaw Ya [ˈbamaɡa], Australian English /ˈbæməɡə/) is a small town and locality about 40 kilometres (25 mi) from the northern tip of Cape York in the north of Queensland, Australia. It is within the Northern Peninsula Area Region. It is one of the northernmost settlements in continental Australia and is the administrative centre for the Northern Peninsula Area Regional Council. In the 2016 census, Bamaga had a population of 1,164 people, of whom 957 (82.4%) identify as Aboriginal and/or Torres Strait Islander people. The original site for the township of Bamaga was at a site known as "Muttee Heads" some 20 kilometres (12 mi) south of the present Bamaga township. The present site was established after World War II by people from Saibai Island in Torres Strait, after Saibai Island was devastated by abnormally high tides. It is named after Saibai elder Bamaga Ginau, who evisaged the site but died before it was established. In 1947, the Bamaga township was moved to its present site as a result of a need by the founding people for a larger supply of fresh water. With local industries and the Northern Peninsula Airport (on Urradhi traditional land) Bamaga became the administrative centre for the Northern Peninsula Area, which was made up of the three Aboriginal communities of Injinoo, Umagico and New Mapoon, and the Islander communities of Seisia and Bamaga. All five are Deed of Grant in Trust — communities with their own community councils. Bamaga Post Office opened by September 1951. Bamaga State School opened on 28 January 1964. On 23 March 2005 it was renamed Northern Peninsula Area State College. Some 20 years later, another community, "New Mapoon", was established. It was set up for the forced relocation of people of "Old Mapoon" community, located some two hours north by road from the township of Weipa for bauxite mining. Bamaga State High School opened on 30 January 1973 but closed on 9 December 1994. At the 2006 census, Bamaga had a population of 784. All communities except Bamaga and New Mapoon are located on the coastline and the current residents hold a close affiliation with the sea. The current populations are approximately 75% Islander and 20% Aboriginal. Bamaga and the surrounding communities are located north of the Jardine River which supplies the town water. Bamaga has an Islander population of approximately 700 people with a further 300 temporary non-islander residents. The Community has reticulated town water, which is pumped from the Jardine River. A new water treatment plant has been constructed recently and Bamaga is fully sewered. Bamaga has a tropical savanna climate (Köppen Aw) with constantly high temperatures throughout the year. The dry season runs from early June to late November. The community languages of Bamaga are Kalaw Kawaw Ya, Brokan (Torres Strait Creole), and English, particularly for education and government business. All of Bamaga's internal and main roads are sealed. The major industry is tourism mainly during the drier months of the year. This runs from May – October (The Developmental Road is impassable during the wet season and the ferry across the Jardine River does not operate). The community owns Resort Bamaga, an accommodation house for corporate visitors. There is some cattle production, small business retailing and a concrete batching plant. Bamaga Island Council is the biggest employer with 200 staff. Modern supermarkets can be found at Seisia and Umagico. There is a community pharmacy, general merchandise/clothing store, a video store, Post Office, Service Station/workshop, snack bar, pub and bakery in Bamaga as well as an Anglican church store and thrift shop. Education is provided by Northern Peninusula Area State College. It is made up out of the Bamaga P–7 Campus and Bamaga 7–12 Campus within the Bamaga township and the P–7 Campus which is located in the Injinoo Community. The standard of schooling is reflective to any found amongst most Aboriginal/Islander communities however in recent years standards have improved. There are now 50+ teachers and teacher aides through all schools. The Bamaga and New Mapoon Communities have established Child Care Centres for early childhood schooling. The Cape York Campus, a technical and further education (TAFE) college, has been established at Bamaga. The campus provides a wide range of tutorial courses including seamanship and other courses. The campus is a branch of the Far North College of TAFE situated at Cairns. Northern Peninsula Area Regional Council operates an Indigenous Knowledge Centre at HACC Centre Building in Adidi Street, Bamaga. There is a local Ergon Energy generator powerhouse at Bamaga which continually supplies 240 volt power to all communities. There are two local Ergon linesman stationed at Bamaga. Most lines are antiquated and subject to breakdowns causing blackouts on occasions. Powercards are an innovative idea for electricity supply to all residences in the Bamaga area. These are similar to phonecards and are inserted into the powerboards at each residence. The cards are available in $20 or $50 amounts. There are therefore no issue of power bills as responsibility remains with each household to maintain power by the use of the cards. The quality of the town drinking water has improved of late with the introduction of new community reservoirs and the newly completed water treatment plant by Sunwater. The town water is sourced from the Jardine River supply. Sewerage for all communities except Seisia is by underground sewer. Seisia is proposing to remove all septics in favour of sewer in the coming budgets. Garbage collection is twice weekly (Mon-Thur) and should this not suffice, the local waste depot is only 2 kilometres (1.2 mi) away from the police establishment. Fishing and camping are very popular. A boat and 4WD vehicle would be handy. There is the Bamaga Tavern open Monday-Saturday and Seisia Fishing Club which serves food and drinks on Fridays with live music. There are restaurants at the Seisia Village Resort, Seisia; Resort Bamaga; Loyalty Beach Fishing Lodge, and also Punsand Bay Lodge, Punsand Bay. There are also take-away shops at Seisia, New Mapoon (Loyalty Beach camp ground and local store) and Bamaga communities. The sporting facilities at Bamaga have undergone a recent facelift and there are now established Olympic Basketball courts, Volleyball courts & Tennis courts. Football has again emerged as a strong sport in the region and councils have constructed night lighting of the fields for cooler night games. There are five organised football teams in the communities. To assist sporting ventures in the region, a newly constructed Gymnasium at the Basketball courts will assist with health and training. There are also established darts, pool and fishing. The adventure of a 4WD trip to Bamaga through very rugged terrain is the main catalyst for tourist activity by road. There are many sights, towns and other points of interest during the journey. Tourist activities whilst at Bamaga include Sight-seeing tours to Thursday Island, Guided fishing and pig hunting tours; bird watching in the nearby Lockerbie Scrub rainforest; visiting World War II aircraft wrecks in the Bamaga area and also at Horn Island (near Thursday Island) and photo shoots at the "Tip of Australia". The area is shrouded in history with culture and war memorabilia. Muttee Heads is a fishing/camping spot with access to Jardine River mouth and is 30 kilometres (19 mi) west on Cairns road. Pajinka Wilderness Lodge is 35 kilometres (22 mi) north on Pajinka Road is the most Northerly part of Australia. Twin Falls/Fruit Bat Falls is 65 kilometres (40 mi) south on the Peninsula Developmental Road to Cairns and a great swimming spot. Punsand Bay Resort is a great camping spot some 25 kilometres (16 mi) north. Somerset is 35 kilometres (22 mi) north of Bamaga and the historic ruins of the Somerset Homestead. It is a good camping area and day trip for barbecue. The Bamaga Hospital has an establishment of three medical officers and nine nursing officers who can capably handle most cases presented. Emergency cases are assessed and patients are either helivaced to Thursday Island Hospital by Australian Helicopters under contract to the Department of Emergency Services or by RFDS to Cairns. Bamaga pharmacy is located next to the main ibis store with a fully qualified pharmacist available at all times to provide medications, advice and essential pharmacy services. The Bamaga and surrounding communities are also serviced by the Queensland Ambulance Service. The QAS at Bamaga has two permanent officers which are of paramedic standard and have one of the most modern ambulances in use in Queensland today. Veterinary services are limited but accessible. At present, a visiting veterinary specialist attends the premises of the Torres Shire Council, Thursday Island on a regular basis. Notification is usually in the local newspaper the Torres News. To attend for appointment will necessitate a ferry ride with your pet to Thursday Island. Usually this trip can be completed in the one day unless overnight care for the pet is required. This specialist can also be contacted at her surgery in times of emergency. The Department of Agriculture and Water Resources' Biosecurity Service (formerly the Australian Quarantine and Inspection Service) has a base in Bamaga. The Bamaga township has one major supermarket/variety store which is operated by the Islander Board of Industry and Service. The IBIS services most islands through the Torres Strait. The store at Bamaga is air-conditioned and has a comparable food line with major retailers in Cairns. The store does have frozen meat from Cairns butchers. It is however advisable to purchase in bulk, both grocery and meat when in Cairns and restock from the local store when required. The Bamaga and surrounding communities are well serviced by Sea Swift twice weekly. Freight charges are minimal and delivery is to the door. Air-conditioned supermarkets are also at Seisia and Umagico Communities. Shopping around at all supermarkets will usually find an item. The Seisia Meatworks has recently commenced operation which provides a range of meat products. Meat is sourced locally as well as grain fed regions such as Atherton Tablelands and Gympie. The quality is of a good standard and is found locally at the Seisia Supermarket. Fresh produce is delivered by shipping companies and available twice weekly (Monday and Thursday). A local clothing store has limited lines of clothing and some lines of haberdashery. There is no local hairdresser however there are some on Thursday Island. There are three service stations located at Bamaga, Seisia and Injinoo. Diesel and unleaded petrol are available. Mechanical services are also available at various locations in the Community. ^ a b Australian Bureau of Statistics (27 June 2017). "Bamaga (SSC)". 2016 Census QuickStats. Retrieved 30 October 2018. ^ "Bamaga - town in Northern Peninsula Area Region (entry 1447)". Queensland Place Names. Queensland Government. Retrieved 22 March 2014. ^ a b "Bamaga - locality in Northern Peninsula Area Region (entry 46103)". Queensland Place Names. Queensland Government. Retrieved 22 March 2014. ^ a b "Opening and closing dates of Queensland Schools". Queensland Government. Retrieved 22 March 2014. ^ Australian Bureau of Statistics (25 October 2007). "Bamaga (L) (Urban Centre/Locality)". 2006 Census QuickStats. Retrieved 3 January 2008. ^ "Bamaga Indigenous Knowledge Centre". Public Libraries Connect. State Library of Queensland. Retrieved 13 December 2017. This page was last edited on 16 November 2018, at 10:01 (UTC).